Hi Players & Parents, the season is in the books and 2009 goes down as one of the most rewarding ever! What a fantastic group of girls who played the game the right away, kept advancing their individual skills, and were so supportive. You girls made each other better players and a stronger team. The way you communicated with and respected your coaches was most memorable – this could be the “season of the coconut” or the “motion of the ocean” as the ‘Tide kept risingJ, and with a new “secret handshake”. Liv Ryan is a baller who knows how to have fun too and Jeff Ryan was the steady calming influence in the dugout creating an atmosphere where the girls could grow & excel. A group who cared about their teammates and showed it by dedicating a game to Brittany Creamer. Britt is a great teammate who always gave her best for the team wherever she was needed and we missed her positive attitude too when she went out with a broken collarbone. Emma & Savannah had fine outings in the circle keeping us in the games ‘til our bats broke through. Good luck to Emma at Keene State and Savannah, I hope you continue to play at college in CA, I can see, hear, & feel your love of the game. Megan & Brittany catching the action from behind the plate were great targets. Megan really called & setup well! Brittany with the long shot homer at Devens – good luck at UNE! Kayla really anchored the outfield by taking charge in center and was probably the best #3 batter in any game we played or any team we saw not to mention that cannon on her shoulder – good luck at Plymouth State! Natalie became a top-notch slapper/bunter/on-baser from the leadoff spot and sparked the offense. Elena was definitely the bestest fake-bunt-slugger that we’ve ever had and ever seen – good luck at St. Joes! Devin was very slick in the field with excellent base-running reads. Esther always brought her strong accurate gun from shortstop – now taking her glove to Merrimack College – go for it! Erica wearing her thinking cap to 3B and became a strong defender as well as hitter. Abby stretched ‘em out and scooped ‘em up at 1B. Bryce cranked it up at the plate and was hittin’ the good stuff. I consider it a privilege to be involved with such energetic, enthusiastic, and motivated young people to share our love of the game and the thrill of competition. I know that the game is what it is today because of you players who give it your all. Due to all the various skills, abilities, and roles; there is nothing more difficult than success in team sports, but there is also nothing more rewarding than success in team sports!:-)! Topping off the season with our final game against the eventual tourney winner shows the level of competitiveness that you girls raised yourselves up to. It was very exciting to see you come together and give your absolute best for each other. I look forward to following your progress, stay in touch. Thank you, Parents, for your support and making a fun time for the players & coaches at the post-game cookouts, sharing the pics, keeping us covered, and helping the team! You know after that game I was really struggling to put my thoughts and feelings into words. There was a lot of attention given to events of the game and since you’re never sure when you will play the last game of the season, it’s difficult to be prepared for it. ~ the girls who have “graduated” from 18U ASA and gave the very best of their “senior” year for their RipTide teammates – Liv, Mo, Caitlin Cerise? Sarah? ~ making some new friends, sharing some fun times, and creating some fond memories. ~ the inspiration of having Maureen Kertes with us at every game and practice, knowing that she couldn’t play, but wanting to be part of the team with you! ~ the girls who couldn’t be with us last weekend, Esther & Sarah, and the girls who filled-in, Erika & Emily. ~ the diversity/location of our players - Portland, Yarmouth, Thornton Academy, Husson College(Scarborough), Rhodes College(Gray-NG), Marietta College(Cape Elizabeth), Greely, Cheverus, & Fryeburg Academy and how you became such a strong team in such a short time. ~ how you supported each other and lifted each other up – celebrating our successes(and birthdays!) together. ~ your softball futures and how excited we are to follow you on your journeys through high school and/or college. ~ how appreciative we are for all the help & support from our families & fans especially Coach Jeff Ryan and his positive insightful spirit! For all these things softball does for us, it is “The Greatest Game on Earth”! I feel privileged to have been your coach this summer and enjoyed getting to know you. Sharing our “love of the game” made for an exciting and rewarding season! Thank you for your strong efforts in taking the RipTide to new heights! Just wanted you to know that it was a privilege to be your coach this summer - I enjoyed every minute of it! You did a great job of getting used to a new coach and adjusting with new teammates – all part of the game, especially as you move on to your next team(college, etc.). Even if you enjoyed hearing my “sermons” only a fraction as much as I did giving them, then together we have grown. I hope, most of all, that you feel your game has advanced or skill(s) have improved whether through the playing at a high level of competition, the various positions you played on the field, a coaching tip, or a philosophical sharing of how I feel the game should be played. Our “man with the plan” and Assistant Coach of the Year goes to Jeff Ryan who was always there for the girls and me. At practice and games, Jeff always brought his thinking cap and pencilsJ He was always upbeat and positive with the girls and made it a very enjoyable experience for us all.Thanks, Jeff! Lou Zambello really stepped up to the base this year – first base that is. Lou helped us a great deal this year on the bases and in the dugout not to mention his work on the team statistics and managing the team account, deposits, and check requests. All this requires a great deal of time and energy – Thanks, Lou, for all you do, you earned the following titles: Statistician, Treasurer, and FirstBase Coach! You know I was a little “down” on the ride home thinking about those close games and how we might have won them, when all of a sudden it dawned on me – not only was that Sunday the final day of our summer season, but it was the first day of the 2008 season!!! I’ve been surprised that a couple of players(from larger area towns/cities) asked if there might be an opportunity to join the RipTide for next year. When you girls took the RipTide to the 18U Class A State Finals, the “mark of the jellyfish” was made and it can only get better! You girls are goooooooood! Please stay in touch. Hi Girls, WOW, what a(another) great weekend of softball - I would say the “mark of the jellyfish” is being made in the state of Maine -18U Class A State Runners Up! There were 10 teams battling for the title; Bucksport, Winslow, Coastal Diamonds, Jr Black Bears, Blue Demons, Flame, RipTide, Attraction, Peaches, and Hampden. Congratulations on your 3 – 2 weekend with both losses going to the eventual winner – only 1 team in the state was better. The 18U Class A State Championship game featured many exciting defensive gems, offensive outbursts, great baserunning, and good pitching. It was a tough 5 – 4 loss and though I know you are never happy with an “L”, you finished that game with your heads held high because you know you left it all on the field. I was very proud that you played the game the way it was meant to be played – by respecting your teammates, coaches, officials, opponents, and most of all yourselves - you girls literally ate dirt for each other! I love this game, but not more than you players who make it what it is. It presents many challenges and seeing you girls make the adjustments needed to succeed is very rewarding. Some have thought that playing sports builds character, but I subscribe to this quote by John Wooden, “Sports do not build character. They reveal it.” and this past weekend revealed a great deal about who you are. Greatly appreciate the Moran, Taplin, Pisini, and other families helping to keep our girls hydrated, fed, and ready to play. The hot dog grilling on Saturday afternoon was very enjoyable too. With some new players/old friends helping us throughout the weekend, the RipTide thanks Esther, Sam, and Jenna for being with us and contributing greatly to our success - Esther in a new position at 3rd base(the hot corner), Sam as our DP(also making a nice running catch in left field) and Jenna catching all 3 games(from 3 different pitchers) on Sunday! On Saturday we defeated the Maine Attraction 9 -5 and the Topsham Blue Demons 7-4. That gave us a game vs. the Flame which we dropped 8-0. Our girls showed their resiliency by coming back and putting down the Winslow Explosion 5-0 before running into Flame again. The second time, though, was quite a different game as the RipTide played with confidence and pride and earned the respect of the opposing players, coaches, and fans. It was beautiful weather throughout the weekend – just the kind we waited all year for and we enjoyed it to the utmost. Thanks, Lynette, for the new team pic! Hope you & your families have an enjoyable 4th of July week and I’ll be in touch next week with practice/scrimmage plans and our game times/schedule for the Whitten tourney in South Portland. Hi Girls, what a great weekend in MA!!! There were 32 teams from all over New England, New York, New Jersey, and as far south as Delaware/Maryland - winning 3 of our 5 games versus those very talented groups really puts you girls on the map! Some highlights include a complete game win for each of our starting pitchers, Krissey, Jackie, and Caitlin. Each of those victories were by 1-run margins, showing that our girls are very good under pressure. Caitlin’s win was the 9 inning tie-breaker nervosity. That contest featured Allie’s game-winning 20 foot “smash” J and the double-rundown-play ending with Liv’s tag-tackle(ouch) of the baserunner heading back to second. Most of our players also showed their versatility and game knowledge by playing multiple positions during the tourney. We really hit some rockets this weekend – triples(I think) by Maureen, Isabelle, and Caitlin, but there were no balls hit harder on any field all weekend than the one Isabelle smashed off the 3rd baseman’s shin in that last game. It was hit sooooo hard that the player didn’t even have time to move her glove, then the ball bounced all the way back to home plate. Lucky for her that the ball wasn’t hit higher - she had those long sliding pads pulled down and the ball hit her right there. Many thanks to the Moran, Stayte, and Ryan families for providing the Ice, Water, and Snacks to our girls. Keeping the players watered, fed, and energized throughout the weekend helped them to maintain peak performance levels, especially during the 2 ½ hour cold rain-hail storm delay! Also, Lynnette, provided a nice hamburger & hotdogs cookout that many of us enjoyed while others headed out for some Chinese. Looking forward to the team pics too, Lynnette, please send them to me and I’ll put them up on our website. Look forward to seeing you all at Wednesday’s practice, Greely Rd. field, 6 - 8:00pm. The game times for this weekend’s ASA states in Biddeford/Saco have not yet been announced. I will pass those along as soon as they become available. Hey, let’s put the “mark of the jellyfish” on the ASA tourney this weekend. 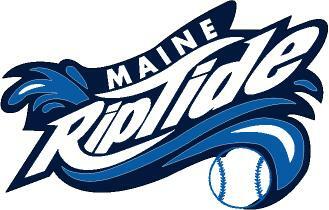 The Maine RipTide kicked off its inaugural season with a resounding success in the highly competitive Southern Maine Diamond Challenge! The RipTide finished the weekend with a 3 – 3 mark and bowed out in the semi-finals! ~ Getting past the Central Mass Magic 8 – 1 in our last pool game on Saturday night. ~ Edging the Southern Maine Blaze 5 – 4 for the 8:00am Sunday morning kick-off game that started around 8:45am. ~ Besting the Rhode Island Thunder 3 – 2 in the very next game(quarter-finals) to reach the semis(final-four)! Let’s keep moving forward and building momentum as we ride the Tide! Playing in the very challenging Maine 18U ASA State Championship in Biddeford gave our team a real taste of the “good stuff”. We ended up with a 2 – 2 record and finished tied for 5th place in the 10 team tourney. Our first game matched us against the eventual runner-up, Bucksport and we played a strong game, going 9 innings, but dropping the decision 3 – 2. Unfortunately, that sent us to the loser’s bracket where we would need to play and win many games to get back to the top. We started out slowly in the next game vs. the Southern Maine Blaze. We were down 5 – 3 in the last inning, but a 5 run explosion gave us the exciting come from behind 8 - 5 win. Then after a short break, we faced the Leavitt Lizards and enjoyed a 5 – 1 victory. That win earned us a Sunday a.m. rematch with Bucksport. This time, though, the game wasn’t close and we were “mercied” in 5 inns. A game like that just makes you want to get right back out there for another chance and a fresh start! At the Eric Whitten Memorial in South Portland, we started the tourney by splitting 2 Friday night games, then winning 1 on Saturday afternoon and losing 1 Sunday for a final tally of 2 - 2. ~ Dropping the first game to a strong Maine Attraction team may have actually helped get us on track. Our defense played quite well and Erika Zambello was selected as “game mvp” by our opponent. In the “PINS” position, she snared a number of line drives to rob the Attraction of hits. ~ Next up was the Maine Peaches a team with players from all over and we played much better, but left a lot of runners on base. We won the game 3 – 1 with Krissey Taplin pitching very well and being chosen as “game mvp” by the Peaches. ~ Late Saturday afternoon, we squared off against the Vermont Rockets. The RipTide jumped out to a 3 – 0 lead, but the Rockets fought back and tied it up 3 – 3 late in the game. Michelle Robb scored from 3B in the top of the 7th on a passed ball to give us the lead 4 – 3, then she retired the Rockets in the bottom of the inning to secure the win and the “game mvp” tribute by the Rockets. ~ Our pool seeding was 3rd of 5 teams which paired with the 3rd seed from the other pool. An 8am Sunday game vs. a strong NH Hawks squad ended our day. They scored a bunch of runs and we didn’t, but we are learning that the elimination games require a higher level of intensity – starting now!